Here at the GPEDC, we’ve all been wondering what Mark Hanback, Director of GP Manufacturing Network, has been up to at TADA, a startup company right here in Peoria. At TADA, Hanback provides leadership as General Manager. So, when he offered to tell us more and give us a tour of the TADA headquarters, we jumped at the opportunity. We stopped by one afternoon a couple weeks ago and learned all about the remarkable technology they’re working on. Companies often find themselves collecting data and filing it away somewhere, whether it be physically or virtually, and forgetting about it. Without someone to connect these data points together and make sense of it all, the business struggles to find solutions to problems they have. So, TADA decided they would take on that task. That’s where TADA’s distinctiveness and uniqueness become apparent. Unlike traditional approaches, TADA inverted the thinking to first design and semantically connect “ideas” from all areas of the business. They call this network a “digital duplicate,” which also allows infinite horizontal and vertical navigation to drill down into available data in a practical way. Once all the ideas are connected semantically, TADA quickly and cost effectively binds data from multiple sources to this network. This means that the business has a full 360-degree view of their company, and can then solve problems more effectively and more rapidly than before. The best part? Tada is offering its cloud-based platform at one-tenth of the cost and ten times faster than alternative products. “It’s a level of speed and value that no one else can provide,” said Mike Clark, Director of Business Development, Marketing, and Sales. The idea for TADA started in 2009 in our region, and was born out of Project Atlas and other CIO projects at Caterpillar. In 2016, TADA spun off from CGN and transferred the IP to new the new identity. TADA team members working on a digital duplicate. Not only was it started here, but many members of the leadership team grew up here and still live in the area. Though they’ve had chances to move to other parts of the country, they’ve chosen to stay because of the sense of community in the region and our great Midwestern culture. TADA has received applications from young professionals all over the United States, but they prefer to look here first. There’s big business right down the street, like OSF, Caterpillar, UnityPoint Health Methodist, Komatsu, and more, which have attracted talent into the region. It’s a target-rich environment for TADA looking for the best-of-the-best to advance their technology. 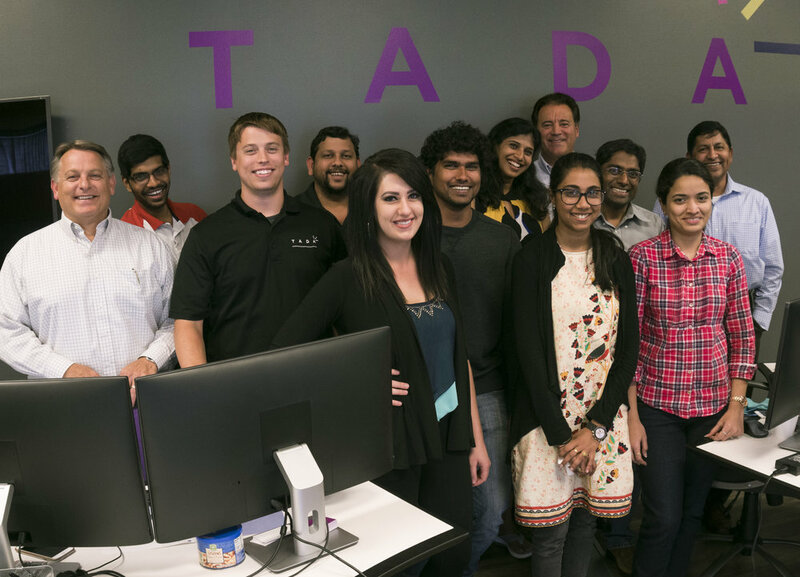 Many members of TADA’s leadership team retired before they took the leap of faith to develop this startup company. So, we at Startup GP wanted to ask the hard question. Why? Ram (Muthu) Muthukrishnan, member of TADA’s leadership team, working in front of the think board. “It’s the hunt, the adventure. It pays off in the end,” said Hanback. They’re doing hard work everyday building models for individual customer needs and working on advancing the technology for future applications and products. But they are not tired of it just yet. Muthu actually took six or seven months before he made the decision to hop on board. Although he was skeptical, he ultimately decided that this startup would be too much of an exciting challenge to pass up. “It’s been invigorating and allowed me to take on new risks and challenges,” Clark agreed. Startup GP applauds TADA. They showed us that if a talented team has an idea, the drive and passion for innovation, and the funding to start something new, then they can make a difference.